Are you escaping the heat and skiing overseas this summer? If so, now’s the time to get ski-fit! We find that lots of people have ski trips planned for Japan and Canada over the summer months. And unfortunately a couple come back to us in March with injuries from their holiday. Now is the perfect time to get ready for your summer skiing so that you can make the most of it and escape injury-free. Not to worry if you’re not hitting the slopes; these exercises will help tone up your legs ready for your summer beach trip! Strengthening your legs prior to your ski trip is the best way to prevent injury and make the most of your time skiing. You might not be surprised to hear that knee injuries are the most common skiing injury. Here are a few exercises to strengthen those legs and prepare your knees for what’s about to hit them! Pilates is also great at building strength and we can customise your program to help get you ready for the slopes. If you need further help, personalised exercises or would like to try Pilates, come and see our experienced physiotherapists. 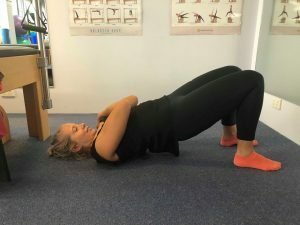 Heels close towards bottom, squeeze bottom muscles and lift hips towards the ceiling. Leaning with your back supported on the wall, feet out in front and even weight in both feet. Slowly slide down the wall into a squat (knees bent about 60 degrees or less if knee pain). Hold this position for 5-10 seconds, and then push up through your heels with spine along the wall into standing. 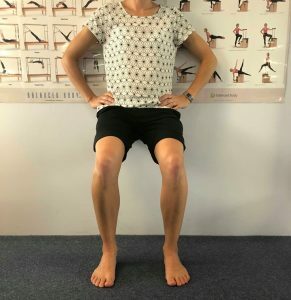 With even weight in both feet, slowly bend knees, stick bottom out like sitting back on a chair. Keep your chest up tall. Knees bent no more than 90degrees. Watch knees don’t come forward over your toes. Push up through your heels back into standing. 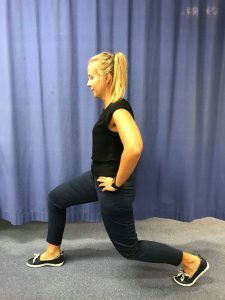 Lunge by lowering your back knee towards the ground then return. Make sure front knee stays vertical and in line with your second toe. 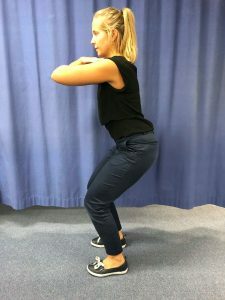 Squat with bottom going backwards and chest forwards (like sitting on a chair). Push up through your heels back into a standing position. Standing tall on one leg, gently turn out other knee to push into the wall. Raise this foot if you are able to. Hold pressure at wall for 5-10-15 seconds. 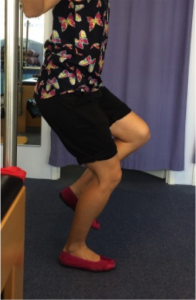 If you have questions, or would like personalised exercises to help you prepare for your holidays, please call or book online to see one of our Physiotherapists.